Dusts and fine particulates pose a major safety issue in many work environments due to the unusual properties materials can possess when ground or otherwise divided into fine particles. In many cases it is the nature of the material making up the dust itself that poses a serious health hazard, such as with materials deemed toxic or otherwise poisonous. In other cases, dusts can be a serious irritant, lodging within lungs and nasal cavities where it can eventually lead to infections and respiratory issues. One of the most serious dangers dusts pose, however, is the threat of fire or explosion if exposed to an ignition source. Almost any type of material, from iron to wheat, can become explosively flammable when ground into fine particulates, and in many cases little more than a spark is all that is needed to produce this ignition. Many industrial processing and manufacturing operations produce prodigious amounts of dust as a normal byproduct of their operations. The processing of foodstuffs, milling and cutting of wood products, and machining of metals all produce great amounts of dust that must be properly dealt with if safety is to be maintained. As we noted, most materials can become flammable and explosive when ground into fine particles. The ignition temperature and energy potential of these particles varies depending on the types of materials and how finely they are divided. Generally speaking, however, the finer a material is ground, the easier it is to ignite. Metal dusts can pose an additional problem as although they are ground up and finely divided into particles, they have not lost their ability to conduct electricity. These are known as electrically conductive dusts, and they can pose a serious problem if they manage to contaminate the inner workings of machinery; particularly electrical motors, switches, wiring and controls. This dust can accumulate and cause shorts which can lead to ignition of the dusts. They can also cause overheating and sparking within electrical motors and moving parts of machinery, again leading to ignition. All dusts can also cause thermal problems as they act as an insulator when they accumulate. A light fixture for example may operate at an acceptable temperature under normal conditions because air is free to flow over and through the fixtures surfaces, thus allowing the housing to dissipate heat. When dust accumulates on top of the fixture however, it acts as an insulating blanket, preventing the fixture from radiating excess heat, leading to the housing becoming hotter than is acceptable and potentially producing a fire or explosion hazard. As can be imagined, protecting against the hazards of combustible dusts is a major issue in the industrial workplace. Although OSHA is slowly moving to provide effective regulations regarding combustible dust, to date is has been mostly up to operators to figure out the best ways to provide protection and the levels of protection needed. Fortunately, the National Fire Protection Agency NEC publications provide excellent guidelines concerning protection in hazardous environments. As with explosion proof and intrinsically safe lighting designed for use in environments where flammable gases and vapors are present, dusts also are included with the NEC hazardous location classification system. This means that operators can refer to these guidelines just as they do with gases and vapors with a great degree of confidence that the requirements of their particular conditions will be addressed. 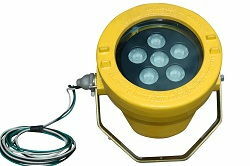 Class 2 light fixtures can be used in locations where combustible dusts are or may be present. Class 2 Division 1 or 2 fixtures may be used depending on the frequency of their presence as noted under these divisions. What is of particular importance for operators seeking light fixtures suitable for use around combustible dusts are the group ratings of the fixtures in question. Group ratings specify the types of dust the fixture is rated against. This is important because as we noted earlier, the properties of dusts can vary widely according to the type of material the dust is derived from, how finely it is divided, and in the case of conductive dusts, whether or not they can pass electrical current. The following is the basic rundown of Groups for explosion proof light fixtures approved for use in environments where combustible dusts are present. You’ll note, each group holds a specific type of dusts according to material types and conductivity, underscoring the importance of choosing properly rated equipment. Also important to note is the “T”, or Temperature Rating of the fixtures. This rating designates the safe operating temperature range of equipment according to the ignition temperature of the materials it will be exposed to. Also note, these T ratings take into account the insulating effect of dusts, hence the “suspended / layered” notifications. The chart below covers some of the more common dust types encountered in industrial operations. As well as ensuring that equipment is properly rated for use in hazardous environments containing dusts, it is also very important that good housekeeping practices are followed. Managing dusts as they are produced by employing dust catching devices and equipment, ensuring proper ventilation of the work area as well as equipment, and keeping to a regular schedule of dust collection and cleanup is all a part of providing comprehensive protection against the dangers of combustible dusts and will help to ensure compliance with local and regional regulations as well as provide the highest degree of worker safety possible.